The Helix is brand-new in our product range: It is a superfast highly insulated sectional door equipped with special rolls that reduce operation noise to a minimum. Traditionally, two doors are often mounted in frequently used exterior openings; an insulated door for use at night and a high speed door that is used during the day. The new Helix / S600 combines the best of both worlds in a single product. An investment that pays for itself in next to no time! The S600 has the identical drive system as the Helix Spiral door but has a standard track system. 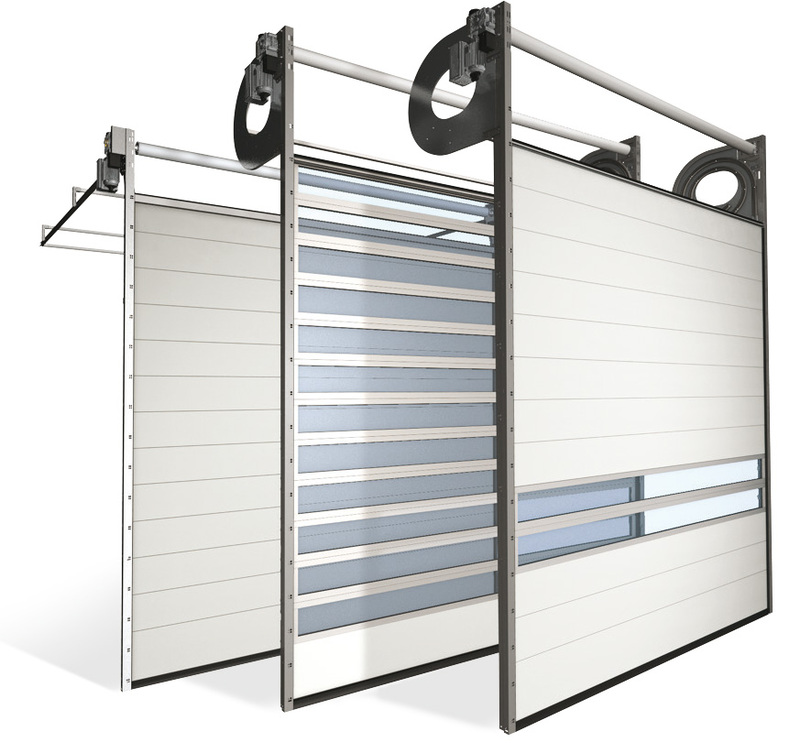 This door opens 6 times faster than a similar sectional door but can be installed into a headroom of only 600 mm. The Helix and S600 have a standard section height of 366 mm. If you have insufficient back room for the S600 you have the solution of the Helix with faster speed! The Helix spiral door opens 6 times faster than similar sectional doors and is therefore extremely suitable in an environment where you have intensive logistic movements. This door opens fast and depending on the door size up to 1.1 m/s and real savings on the energy cost can be achieved. The door leaf has a thickness of 40 mm and a U-value of 1.5 W/m²K (ISO panels / door leaf 5,000 mm x 5,000 mm). Additionally if requested we can provide high-quality, full-width ALU vision sections. The Helix spiral door is a revolutionary innovation and thanks to the spiral system and chain drive does not required extended backroom. To minimize wear and tear, the spiral action of the door means the panels do not touch, roll or fold upon themselves. The Helix offers a solution in a room where the ceiling construction does not allow track hangers for a regular sectional door. Because of the intelligent drive system without counterbalance, the Helix spiral door does hardly need any service upto 200,000 cycles.